Since we bought our house under the First Time Home Buyer's Tax Credit, we're going to get $8000 in a tax credit that we'll use on our house. I've been thinking of how to fix the kitchen to make it more open for us - we spend a lot of time in the kitchen. I've had a lot of ideas and plans but think I may have thought of something that I really like. I've drawn it out here on paper and uploaded it so I could share and get feedback. Our kitchen is long and narrow - and in need of bringing in to this millennium. As you can see from the picture above, there is linoleum on the floor - the counters are laminate straight from a 1970's diner (gold specks and all), and our appliances have manuals without computer graphics. 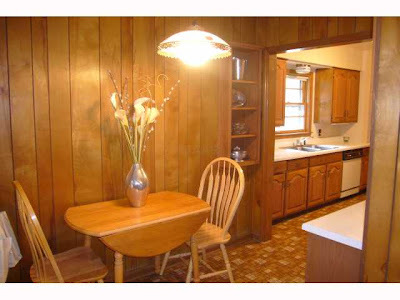 In addition, there is an awkward divide between the actual kitchen and this small hallway/breakfast nook that is open to the den. It is very hard to explain the layout of the kitchen, so I drew a layout (not to scale - at all!). Our issues are mostly in the closed off feel of the kitchen and what to do with the unused space by the back door. Currently that space has my shelves and wine rack, as well as the bowls for the dogs' food. 1) I'd like to open the den up to the dining room without taking the division away entirely. We also have two HVAC ducts in those walls that would need to stay. My architect in training brother came up with the idea to have columns running floor to ceiling (hiding the ducts) with 3 ft bookshelves extending from the column to the wall, with it open above the bookshelves. They could be two sided and display on both sides. 2) Basic updating in the kitchen would include new appliances (stainless), running a gas line for a gas range (gas is in the pantry so this would be easy for our contractor), new counters, putting a glossy stain on our cabinets (which are in good shape), replacing the hardware on the cabinets, and putting down a better floor (perhaps a stone looking tile or maybe even cork flooring). 3) Taking the wall that separates the den from the kitchen and turning it into a counter height bar - keeping the cabinets on the bottom but visually opening up the space. It is only about half the wall in the den so you'd still have a wall to put the TV in the corner but it would open it up. 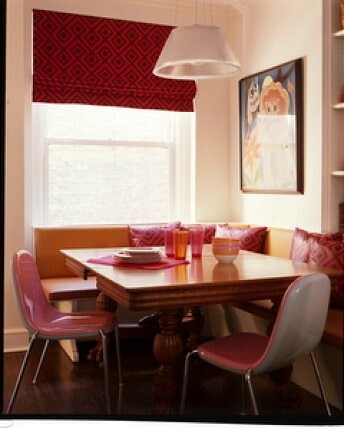 Put pendant lights above the counter and have low stools in the den for seating. 4) On the wall in the hallway (the one shown as a breakfast table area in the first picture), put narrow pantry space (this hallway is narrower than the kitchen) that could house canned and dry goods and maybe even cleaning supplies. It can be about 16 inches deep. Two of these pantries would flank an open display area with plate racks on the top and glass door cabinets on the bottom. 6) Since we need a back door, take out the three windows in the den and install french doors leading to a deck (a girl can dream?) in our backyard. i'm so behind on all my blog reading...i just finished your last few posts! your nye post cracked me up, because way for us to have the same hair ;) i'm about fed up with all my length, but trying to decide if it's long enough yet to do locks of love without going too short. anyway, your kitchen: big plans! i like the idea of opening it up and adding the corner banquette and french doors. i know you won't be sad to wave goodbye to the 70's!